Home Sweet Home Child Care's educational components set us apart from the competition - and sets your child on the path to success. Below are some examples of how enrichment activities at Home Sweet Home benefit the children in our programs. We believe that the best way for children to learn about STEM is to experience it by touching and seeing: smell a flower, and talk about the petals or the butterfly that just landed on it. They learn to connect science with what they see in the world. We stimulate a child's sense of wonder and natural curiosity by make STEM come alive: with hands-on experimental learning. We’re engaging young minds with fun, sensory activities that provide experiences that form the foundation for STEM learning. We know that babies toddlers observe, investigate, discover and explore the world using their five senses. They start playing with blocks and stacking cubes as early stages of engineering. Children begin their journey into math by comparing texture and shape, and identifying numbers. 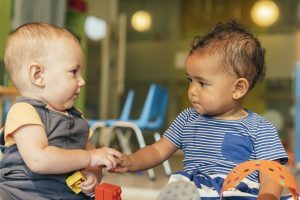 Social and emotional development activities support your child's ability to express and regulate feelings, and develop relationships with others. Infants deeply connect with our caregivers, helping your baby form relationships that foster a sense of security and trust. 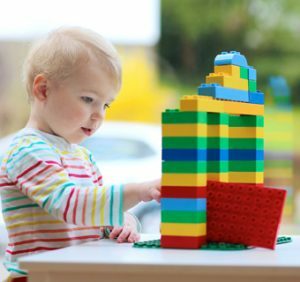 Toddlers develop feeling of independence as they learn to do things for themselves and use language to express themselves. As they grow with us, they show increased interest in interacting with other children. Social learning includes being kind to friends, playing side by side, and taking turns. The development of early literacy skills is a large part of our day integrates activities for listening, speaking reading and writing. The children are introduced to the joys of language. We build an understanding of words through interactions with adults reading books and use of a growing vocabulary to communication for a variety of purposes such as to express needs, wants and ideas. The children are exploring writing by making simple marks and scribble on paper understanding that drawing and writing are ways to communicate. We cultivate a language-rich environment from which babies develop the lifelong love of books language and reading. Our Nature Explore certified outdoor classroom offers children ongoing experiences with the natural world and its cycles. Our beautiful exterior play space creates opportunities for authentic learning that allow children to investigate and discover through their senses. We dance around the room singing songs and learning rhythm. 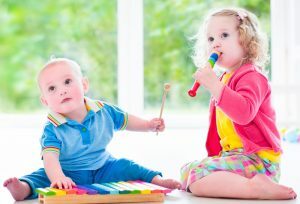 Banging on drums and playing music instruments expands the children's understanding of musical concepts. On Tuesdays, we have a professional music class by STOMP and SHOUT. They are a multi-arts program offering music classes and a bi-weekly puppet show. The dramatic play area allows children to pretend and show off their imagination skills. They are often found putting a baby doll to sleep, chatting on a toy phone, or driving an imaginary car. As we are interacting with each other, we are developing language and communication skills. Puppet storytime bi-weekly promotes social interaction, imagination and listening skills.